Vive le Roi! 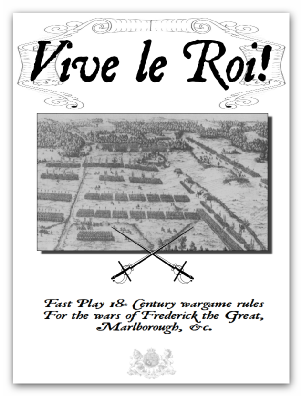 is a set of fast play 18th century grand tactical wargame rules bringing out the differences in drill and the like throughout the century. The first half of the rules are the game mechanisms, with details on basing units and creating a wargames army in the second half (since during play it is useful to have the rules at the front!). Each infantry battalion, cavalry squadron, and artillery battery is represented by a single stand with armies organised into brigades, wings and having a baggage trayne. National differences are covered. The game sequence is basically of the You go – I go type. Shrinkage, disorder, confusion and routing.